Ionic liquid-modified silica, with functional groups based on imidazole as the cation, was obtained. A molecular imprinting technique was introduced to form the order of functional groups. The selectivity of the obtained ionic liquid-modified silica was successfully used as a special imprinted sorbent in the solid-phase extraction to isolate cryptotanshinone, tanshinone I and tanshinone IIA from Salvia miltiorrhiza Bunge. Several washing and elution solvents with different polarities were evaluated. The ionic liquid-modified silica as the sorbent exhibited a higher selectivity than blank ionic liquid-modified silica, traditional silica and C18 cartridges. 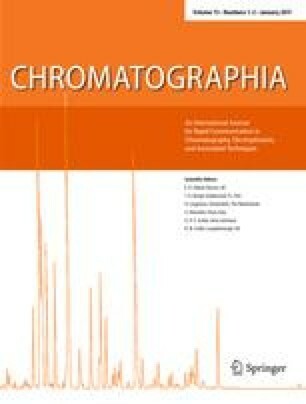 A quantitative analysis was conducted by liquid chromatography with a C18 column and methanol/water (75:25, v/v, containing 0.5% acetic acid) as the mobile phase. A good linearity was obtained from 0.5 × 10−4 to 0.1 mg mL−1 (r 2 > 0.99) with relative standard deviations that were less than 4.6%. This research was supported by the Basic Science Research Program through the National Research Foundation (NRF) of Korea funded by the Ministry of Education, Science and Technology (2010-0015731).